From the design wall to a flimsy....it felt good to wrap up this ongoing Saturday Sampler this past weekend. My yellow and orange roses provided the perfect end of summer photo spot don't ya think! My sewing mojo is coming back, which is a good thing as my September project list is long! Winners will be announced the first of every month! Thanks for stopping by! Aughhhh, the first day of school is behind me and the new school year has started. I'm happy to report that our district redistricted some students and I did NOT start the year with the projected 36 students...but 29. (I know, that's still a lot of second graders, but I'm use to 28-30.) I have to tell ya though, it feels good this Sunday morning to be sitting here at the blog, finding myself getting back into old routines of spending the morning visiting your blogs and completing misc. 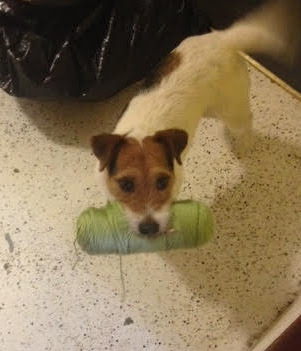 household chores, looking forward to a long walk with Jackson and some afternoon sewing! Whether quilting, knitting, or building, Math really is an intertwined skill isn't it? Thank goodness, some right brained fun of painting always seems to follow! Anddd as I get back into my studio, without a doubt I'm particpating in Lorna's Dog Gone Cute QAL/Blog Hop! I can't wait to make a Jackson quilt!!! I'm looking forward to picking out fabrics and getting my coloring page done this afternoon! Until then...happy sewing! This week's theme is SCHOOL. Whether you are a young mom getting young ones "geared" up for a new school year or a Grandma like me, and just the site of school buses back on the road makes ya reminscent of days gone by, there's something nostalgic about the beginning of a school year for one and all. I'm looking forward to rejvinating many of my own classroom quilts today but feel welcome to rejuvinate any "school" themed post. For example, our blogging buddy Tanya made this fun perpetual calendar for one of her classrooms. Click right here to read more about the resource she used for this. Cute huh! Oh! 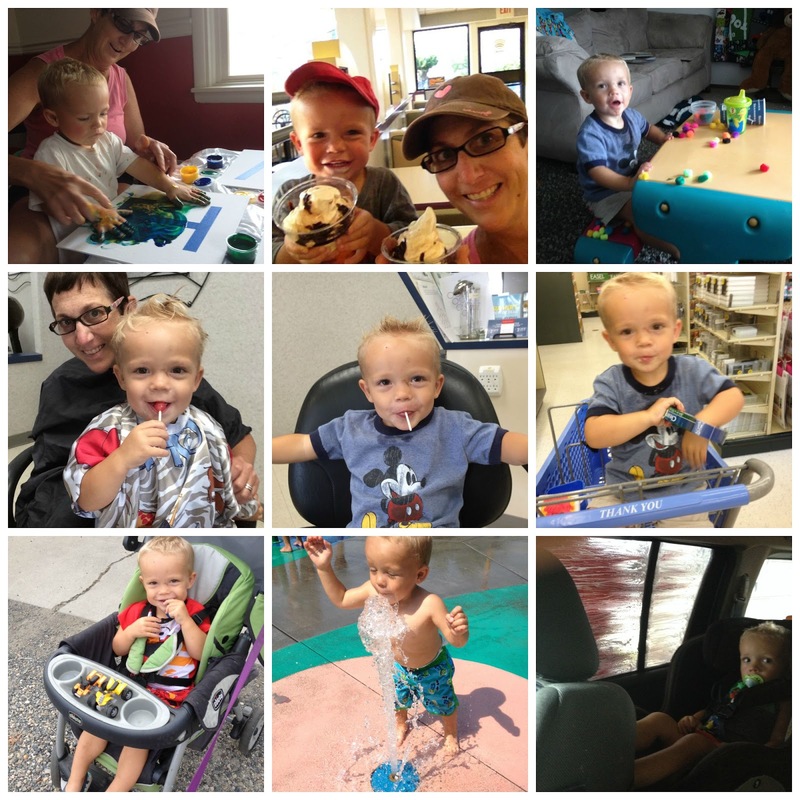 How lucky I was to wrap up my summer spending it with our little grand guy! The motto is: Drink Creatively. I did! My dots kinda grew after that second glass of wine! LOL!! And due the awful fires we are having here in Eastern Oregon, our daughter decided to drive me home once the highways reopened and spent the weekend at home. Which meant out little guy got to see his Papa. 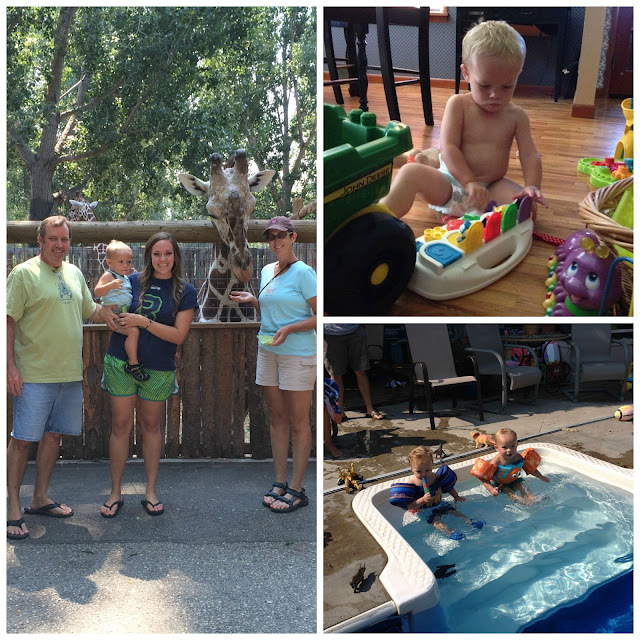 Our weekend went fast as we enjoyed swimming with our neighbor's grandson (the boys are only four days apart....lots of fun listening to them say: "no mine"....LOL!!) and a trip into the city for an afternoon at the Zoo. Mostly, I have to admit, I just love watching him quietly play and develop. 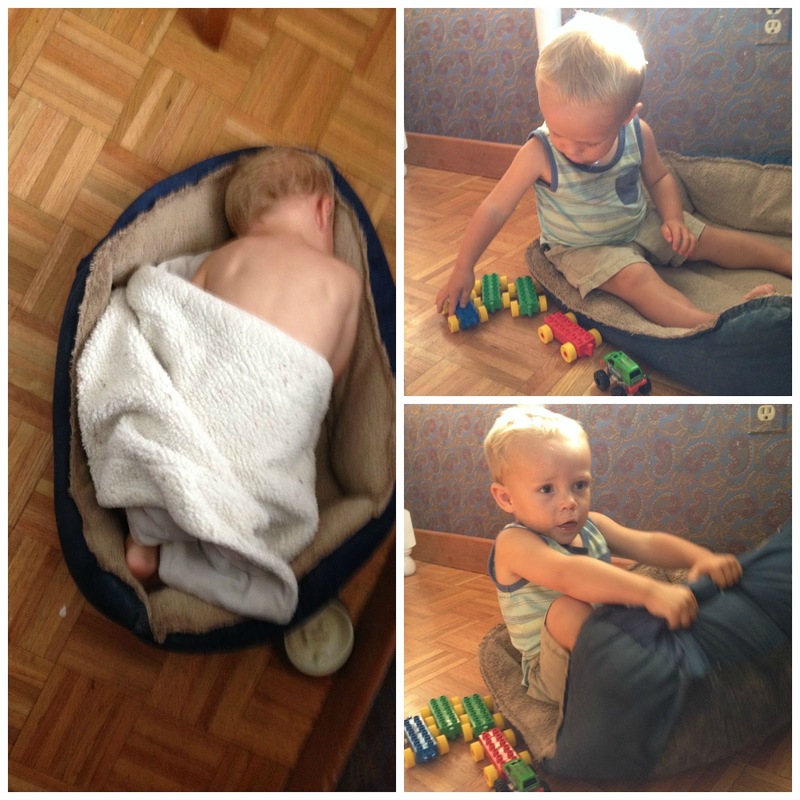 Aaannnnd....I always laugh that he finds Jackson's bed the coziest and FUNNIEST toy of all! Augh....at 22 months old, this little guy is such a blessing in our lives. But I have to tell all you young quilter mom's out there how much I admire you! I didn't get one stitch of sewing done this past week and I was exhausted!! How do you do it??? I'm looking forward to participating in Pets On Quilts here on the ol' blog. Oh! I also signed up for Lorna's: Dog Gone Cute QAL/Blog Hop!! 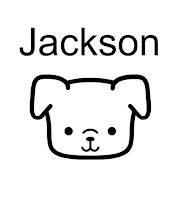 Ya know mine will be a Jackson themed sampler for sure! Until then, it feels good to be home. This upcoming week finds summer behind as I busy myself preparing for the new school year ahead. Looking forward to getting back into the sewing room soon!